You do not want to miss the first Tailgate of the season. 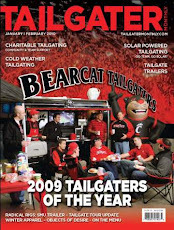 Don't let last week's punch in the mouth keep you from cheering on the Bearcats at home against Indiana State. I think we can expect Coach Jones and the boys to be ready to put a smackdown on the Sycamores. Kick-off is at 12pm at the "Nipp" and the Ultimate Tailgate Trailer will be set-up by 9:00 AM. We will have plenty to drink and a selection of breakfast bites, but please bring a dish to share with everyone. We will be in the same great spot on the corner of Short Vine and W. Daniels across the street from the Sigma Sigma House and Daniels pub. Come Early, Be Loud, and Wear Black. As always everyone is welcome (must be 21 to drink)and donations are appreciated to off-set our costs.